Our Ultramir® in a new French product! - Alesco S.r.l. A new product containing one of our ingredients has been launched in France by the Laboratoire Lescuyer®, an institution with more than 20 years of experience in the natural food supplements industry. The product is called Oronat spray gorge (meaning “for the throat”). It is a dietary supplement based on plant extracts including our myrrh extract – Ultramir – blended with grapefruit seed extract, blackberry, thyme honey, eucalyptus oil, propolis and zinc. The myrrh – Commiphora molmol – contained in our Ultramir is a natural aromatic gum resin secreted by the Burseraceae tree’s bark, which grows spontaneously in Somalia. In the end of summer this tree is full of flowers and nodes on its bark, from which myrrh -once dried – is harvested. The crop is more copious during dry seasons, during Spring and Autumn. 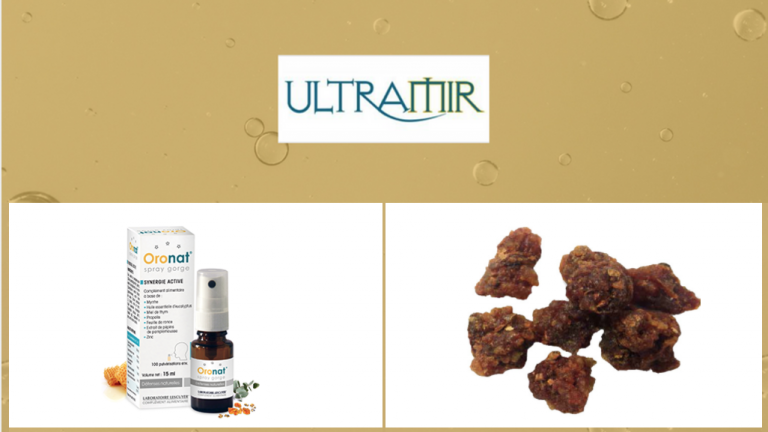 Our Ultramir has been created two years ago, after a careful selection among various types of myrrh of different origins. Among Morocco, Pakistan, Ethiopia at the end the choice fell on Somalia where we have identified a cooperative of local pickers which still manually collects the gum resin in some particular areas of the desert.